Taco Bell invites you, in its latest commercial featuring the $5 Triple Double Crunchwrap, to “take your crunchwrap love to the next level. Literally”. The 15-second spot features the ingredients used for this crunchwrap, namely seasoned beef, nacho cheese sauce and crunchy tostada. 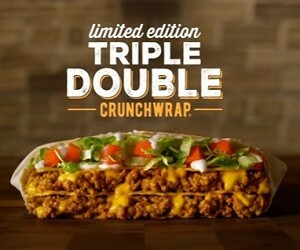 “With a whole new level of seasoned beef, nacho cheese sauce, and crunchy tostada”, Taco Bell’s new limited-edition Triple Double Crunchwrap will make you “triple double love it”.